My mom talked me through those first few months and assured me that this too would pass and would be worth every minute. She was right! Whether we are pregnant of not, we want to focus on eating healthy and living healthy. Exercise and a good diet make us feel better. This isn't anything, new, we have all heard this for years. When we are expecting, we need plenty of fruits, vegetables, whole grains and lean protein, you know, the usual. But there are a few other nutrients that are especially important when we are pregnant. Folate helps prevent birth defects. It also decreases the risk of low birth weight and preterm delivery. We need: 800 micrograms of folate of folic acid a day before conception and throughout pregnancy. Where can you find folic acid? In fortified cereals, leafy greens, citrus fruits, dried beans and peas. Calcium builds strong bones and teeth. It also helps the muscular, nervous and circulatory systems function normally. We need: 1, 000 milligrams a day. Where can you find calcium? Dairy products like juice, milk, yogurt and cheese. Salmon and Spinach, Fruit juices and cereals fortified with calcium are good too. Promotes bone strength and builds your babies bones and teeth. We need: 600 IU a day. Where can you find Vitamin D? Fatty fish like salmon and tuna, fortified milk and orange juice, Asparagus and eggs. Protein is vital for baby's growth, and is especially important during the last two trimesters. We need: 71 grams a day. Where can you find Protein? Poultry, lean meats, fish and eggs. As well as in cottage cheese, lentils, peanut butter, milk, and lentils. Getting enough iron has always been something I have struggled with. Especially during pregnancy. This last pregnancy I found out what it was like to have iron infusions. Yikes. I hope I never have to go through that again. I wrote all about it last year. Iron makes hemoglobin, which is a protein that carries oxygen throughout your body. When we are pregnant our blood volume increases to help make our babies blood supply, and we need more iron. We need: 27 milligrams a day. Where can you find iron? Red meat, spinach, poultry and fish. Beans, and fortified cereal. I learned about DHA when I was pregnant with our third child. DHA is food for the brain. About 70% of energy supply during fetal development is devoted to brain development and our babies depend on us for their DHA supply. If we don't have enough DHA, then it can impact our babies brain development. Most OB's suggest pregnant women to take a multivitamin with DHA. You have probably also seen DHA written all over baby formula too. Where can we find DHA? Fatty fish like tuna, salmon, mackerel and trout. Eggs also have a little DHA. Another great place to find DHA is in a multivitamin. 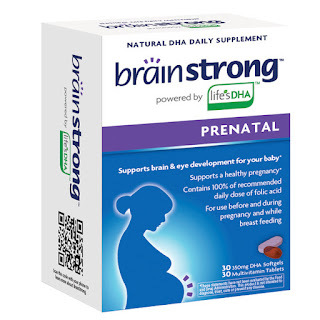 I recently learned about a multivitamin called BrainStrong. It is a complete prenatal multivitamin with the highest level of folic acid and DHA available without a prescription. It has up to 75% more DHA than other leading over-the-counter prenatal vitamins. And the DHA comes from a vegetarian source, not fish, so you don't have to worry about potential contaminants. 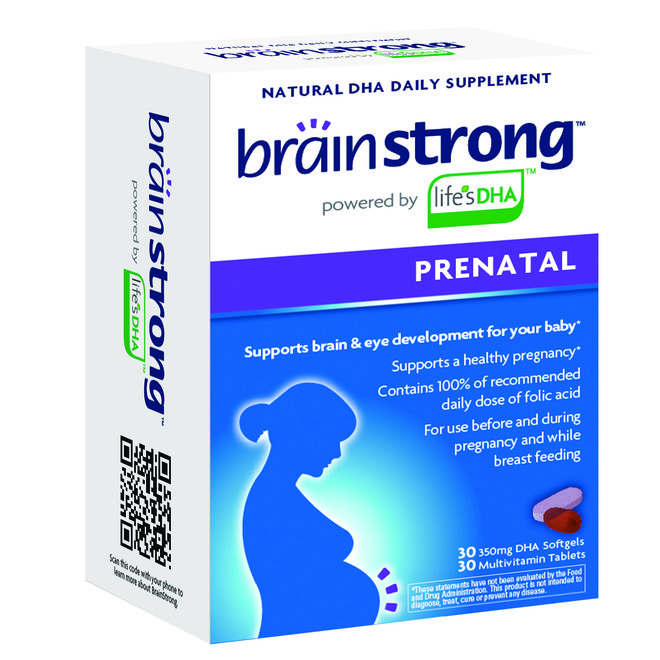 BrainStrong provides assurance that expectant moms are doing everything to support a healthy pregnancy and baby. Okay, shout out, Who's pregnant, and when are you due? Any Christmas babies out there? Congratulations! Our Oldest Daughter was scheduled to be born on Christmas Day. She ended up being 3 days late, but her birthday makes December extra special. Hope your feeling good, December will be here before you know it. I'm pregnant with our 3rd, but not due until March. :) Thanks for this post, I had wondered what DHA was. Thanks Alicia. I am like you, I kept hearing about DHA, but never really knew what it was, or why we needed it. Congratulations on baby # 3!